Researcher builds supercomputer with Raspberry Pi boards #piday #raspberrypi @Raspberry_Pi « Adafruit Industries – Makers, hackers, artists, designers and engineers! A researcher at the Los Alamos National Laboratory in the US has developed an affordable, scalable supercomputer system using thousands of inexpensive Raspberry Pi nodes. The system brings a powerful high-performance-computing testbed to system-software developers and researchers while reducing the cost and power consumption compared to other HPC systems by using boards from the Raspberry Pi Foundation in Cambridge. He system consists of five rack-mounted Pi Cluster Modules, each with 150 four-core nodes of Raspberry Pi ARM processor boards. They are fully integrated with network switching infrastructure. With a total of 750 CPUs with 3,000 cores, the system gives developers exclusive time on an inexpensive but highly parallelized platform for test and validation of scalable systems software technologies. The whole system uses 2.2kW of power. 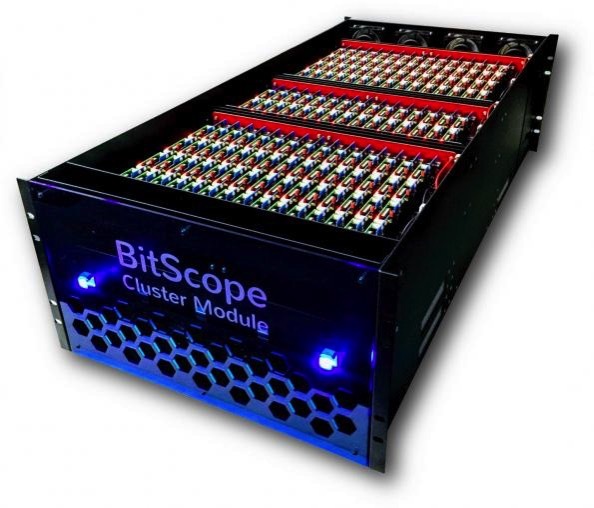 “Having worked with Raspberry Pi for quite some time, I’ve long thought it the ideal candidate to build low-cost cloud and cluster computing solutions for research and education,” said Bruce Tulloch, CEO of BitScope in Australia which developed the racks. The Pi Cluster Modules can also be used for better simulation of large-scale sensor networks, with flexible I/O to connect the actual sensor devices as well as HPC network topology research, to improve production performance, as well as applications that scale across the internet of things (IoT).